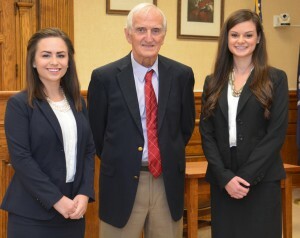 The honorees are third-year law students Alexa Kluska and LeAnna McMenamin. D. Reece Williams III himself presented the award, which includes a certificate and a cash prize, to Kluska and McMenamin. Their names will go on a plaque, and they will be recognized at the School of Law’s annual Awards Day in the spring. The competition involved trying an involuntary manslaughter case. The defendant was a high school track coach. A student had died during track practice, and the case turned on whether the death was due to the coach denying the student water, or was a side-effect of an anti-anxiety drug she was taking. Each team had to take turns as both prosecution and defense. It was good practice for Kluska and McMenamin, as both are interested in working in criminal law once they join the bar. McMenamin is particularly interested in being a prosecutor, while Kluska is interested in either side of criminal litigation. McMenamin is currently working at the 5th Judicial Circuit Solicitor’s office assisting an attorney who handles criminal sexual conduct cases. Kluska currently interns at a civil litigation firm, but next semester will work at the state attorney general’s office, where she would like to learn more about enforcing laws against criminal sexual conduct and human trafficking. Alexa, the daughter of Dr. Michael and Melissa Kluska of White Sulphur Springs, West Virginia, graduated from Greensburg Central Catholic High School near Pittsburgh, Pennsylvania, and got her undergraduate degree from Washington and Jefferson College in Washington, Pennsylvania. LeAnna is the daughter of Charles and Kitty Smith of Johnsonville, South Carolina. She graduated from Johnsonville High School and received her bachelor’s degree in business from the University of South Carolina. She is married to Patrick McMenamin of Columbia.